To darken the outer corners of my eyes for a smokey look, I actually use the Elf Eye Crease Brush($1). Then, to apply shadow to the lid, I prefer the Morphe M167 Oval Shadow Brush($5). Finally, if you like to smudge a little shadow on the lower lash line, I recommend the Morphe M222 Round Crease Brush ($3). To see how I use these brushes, check out my YouTube channel tutorials. For foundation, my preference is the Real Techniques Expert Face Brush. The small dome-shape does wonders with blending in foundation. Also, it’s only $8.99. I’ve had mine for over two years and it’s still working well. Besides using foundation on my face, I also use concealer to touch up blemishes. To apply the concealer to various spots on the face, I use a Sonia Kashuk Concealer Brush. The exact brush I use is no longer available, however, when picking out a concealer brush, I recommend that you choose a synthetic brush such as this one. A synthetic brush easily spreads the concealer without absorbing a ton of it. To blend the concealer in, I use either a Beautyblender or the Morphe Highlight and Contour Sponge. Since I apply a brightening concealer to my under-eye area and do not want that to crease, I always have to set it with a translucent powder. To do this, I use the Real Techniques Setting Brush, which is $7.99. 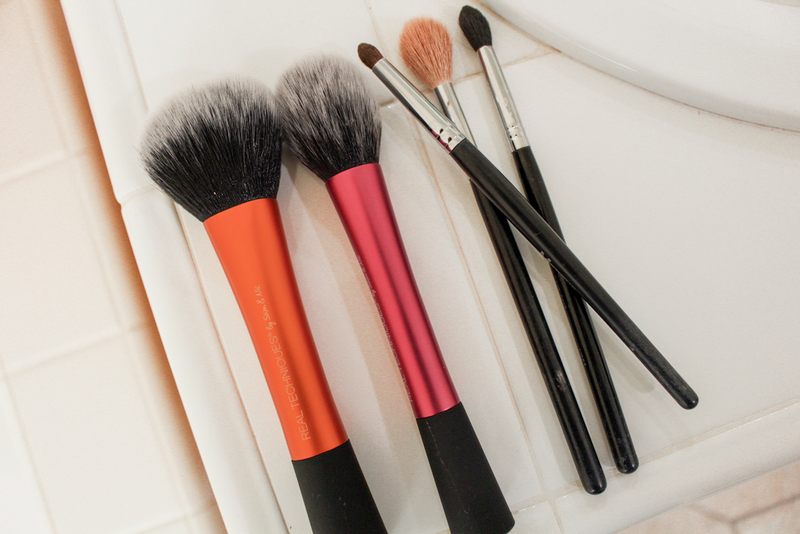 If you use a pressed powder all over the face, having a big powder brush is key. I’ve used the Real Techniques Powder Brush for years and swear by it. Like with my other Real Techniques brushes, I rarely have hairs fall out of this brush and it evenly applies my powder. Also, it’s only $9.99. If I have not made it clear enough already, I love Real Techniques brushes for my face and my blush brush is no exception. The Real Techniques Blush Brush is a larger oval shaped brush. While some people prefer a smaller brush for blush, I find that the slightly larger one applies blush in a way that looks more natural. This brush is only $8.99. I’ll be honest — I don’t have a good recommendation for this. I’m really in need of a new bronzer brush, but have not had time to research it. I’ll do that soon and report back with what I find. I seriously do not know what I did before highlighter. I LOVE it. To apply it, my preference is the Morphe M510 Pro Round Blender Brush. At $8 this brush is super affordable, but it’s important to note that it’s also great quality. I’ve been using this brush for almost a year now and no hairs have fallen out. It’s the perfect size and precisely applies my highlighter every day. All the Morphe brushes I mentioned can be found on the Morphe website. Additionally, quite a few of them are sold online and in-store at Ulta. For the Real Techniques Brushes, these are available on the Real Techniques site, Target, Walmart, and Ulta. The Beautyblender can be found online as well as at Nordstrom, Ulta, and Sephora.